The 118 members of the Illinois House of Representatives took a collective oath of office on Wednesday, January 11 in the presence of family and friends in the auditorium complex of the University of Illinois at Springfield (UIS). The new State Senate convened for the first time at the State Capitol on the same day. Both chambers re-elected their majority leaders. As part of the ceremony, after taking the oath the new House convened at UIS in its first session of the 2017-2018 period. Jim Durkin was unanimously reelected as House Republican Leader by his colleagues. In his inaugural speech, Leader Durkin redoubled his call for budget reforms to end the current fiscal crisis facing the State. The House Republican Caucus added 10 new members. The freshman members were elected by their neighbors throughout Illinois, including the Chicago area and Downstate, to fight for economic growth and a taxpayer-friendly government that can live within its means. This month, I was appointed to serve on the Public Utilities Committee, Public Safety Appropriations Committee, the Special Committee on Police and First Responders, Committee on Counties and Townships and the Energy Committee in the new 100th Illinois General Assembly. Many of my constituents are employed by the energy sector and these committees will be an excellent venue to advocate on their behalf. I look forward to being your voice in Springfield. I am extremely excited to use my knowledge of counties and townships from my time on the Grundy County Board. I believe this is the perfect time to enact good government reforms. Over the past few weeks, I have met with several local farm bureaus and discussed their legislative priorities and how I can best represent their interests when I go down to Springfield. They brought up several interesting points and I look forward to being a strong proponent of agriculture in Illinois. I have recently met with several school superintendents as well. I am very appreciative of all the hard work they have done to produce such outstanding young men and women. We discussed the future of education in Illinois. By working together, we can make our education system even better for our students here in the 75th district. I will continue to meet with local leaders and share ideas in the coming months. If you would like a meeting, please contact my office and we will get you on the calendar! I would like to take this opportunity to congratulate the Will County Farm Bureau college scholarship recipients for 2016. Agriculture is a vital part of our human existence and our state’s economy. Thank you, young farmers for taking part in something that puts food on the table for everyone. I also want to thank the Will County Farm Bureau for offering scholarships for our youth. The Will County Farm Bureau is a fantastic organization which funnels 94% of donations directly to student scholarships. This year, they will offer 29 scholarships at $1,200 each for high school seniors who will be college freshman in fall of 2017. Their application deadline is Mar. 1, 2017. Please remember that my door is always open to address any of your concerns regarding state legislation. My office also serves as a resource if you need help navigating any state government agency. We are happy to help. If you would like to stop in, our office is located at 1421 N. Division Street in Morris. 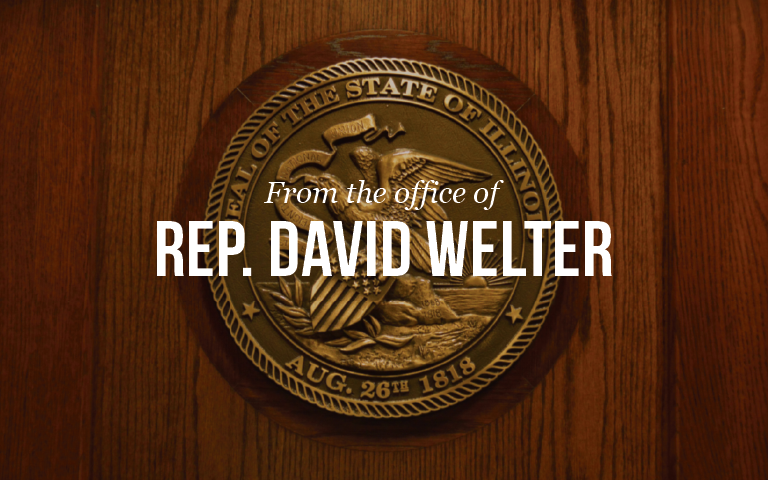 We can be reached by telephone at (815) 416-1475 or by email at welter@ilhousegop.org. Hope to see you soon! In the meantime, stay well 75th District!